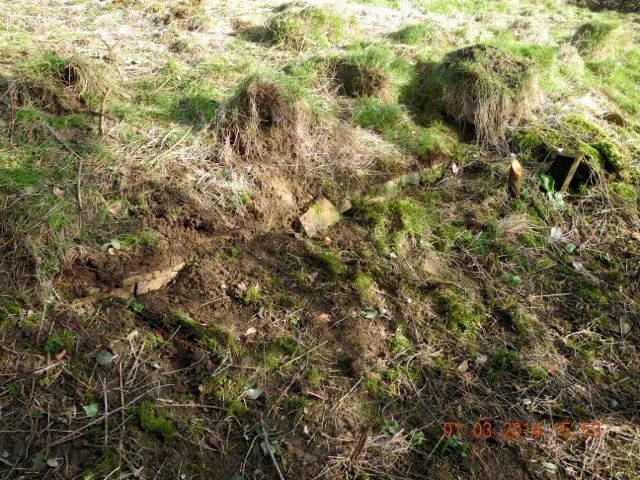 At Enstone work continued to clear the area around the shelter of assorted dead caravans, redundant fencing and, in the field to the north, the remains of the Leylandii. 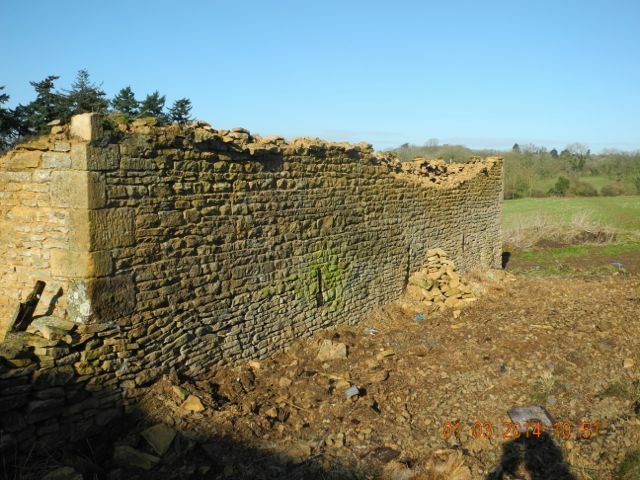 With admirable promptness work began to repair those sections of drystone walling on the eastern boundary of the property which collapsed during the winter storms. Now that the clutter has been removed it is easy to see that this building, despite only having three sides, is full of interest and is a multi-period structure based on a surviving portion of wall which once defined the eastern side of the first garden terrace. At some point this will be treated to detailed recording and analysis. East wall of the shelter, view looking north. 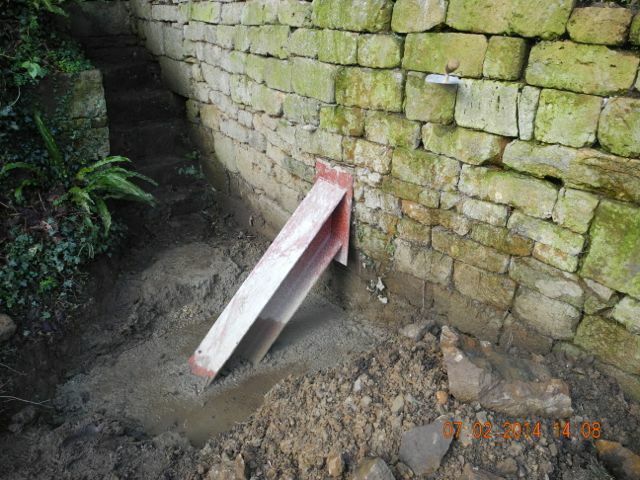 Repair work on the drystone wall to the east. 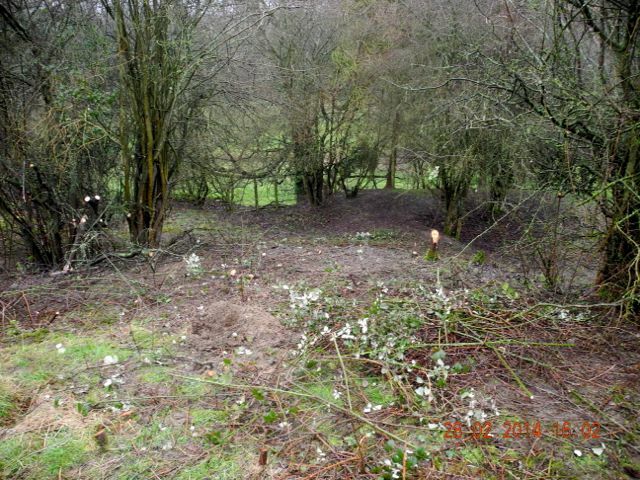 Inspired by the continuing campaign of clearance it was decided to remove the clump of blackthorn which masked the features on the north-west corner of the formal garden. Nick and his dad made a start on this but in an epic campaign waged during a day of near continuous rain we shifted a good part of the remaining bushes. 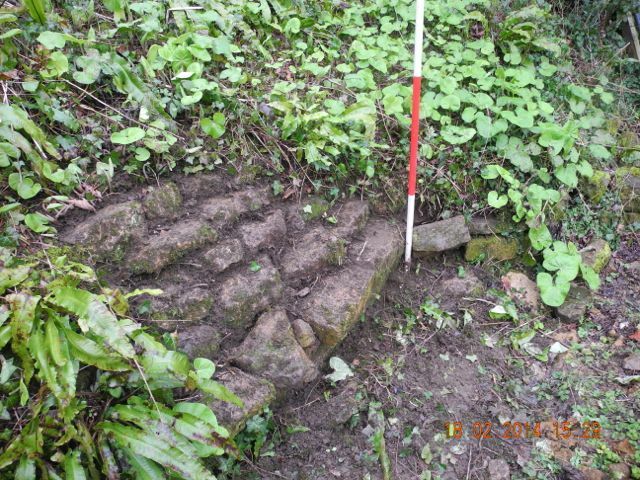 As well as making the form of the earthworks much clearer this also resulted in the discovery of a new wall, or possibly the top of a flight of steps terminating the 'alleyway' that marks the northern edge of the garden. The sunken feature to the left and the alleyway to the right, looking west. The end of the alleyway looking down into the valley to the west. The continuation of the wall that marks the south side of the alley way, looking north-west. A wall emerges, view looking south-east. At Hanwell the start of the month was marked, as in the rest of the country by copious amounts of rain. On the plus side this gave us a chance to see some of the ponds partially refilled and to enjoy the sight and sound of rushing water as it gushed up out of the ground. the downside was that the annual 'Stars and Snowdrops' weekend had to be cancelled. 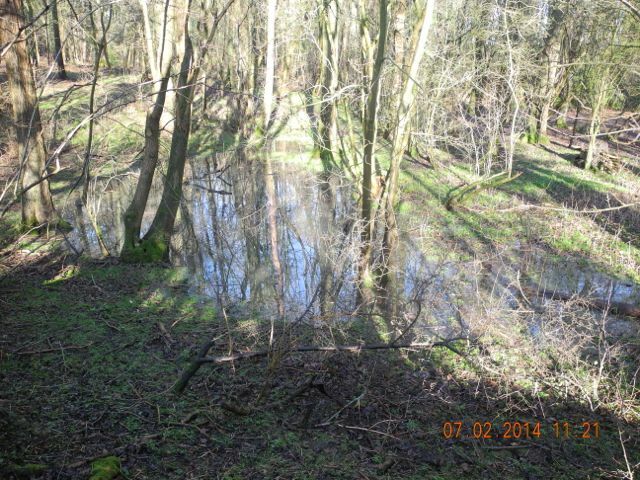 The weather was not too bad over the weekend itself but the ground was so saturated that the passage of too many feet would have turned the paths and the areas around them into total quagmires. 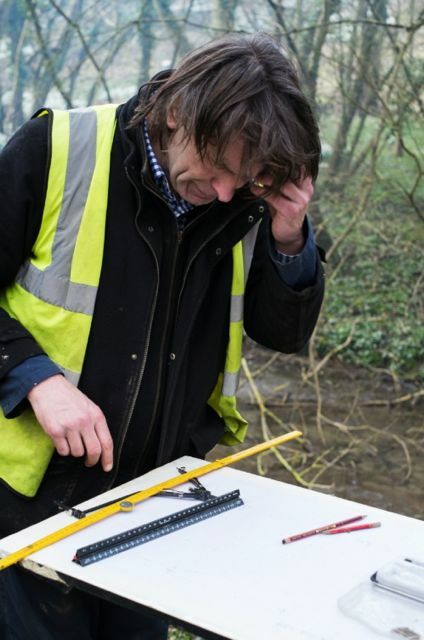 Sad but plans are being developed for a 'Gardens and Galaxies' event for the last weekend in September. The lowest pool partially filled with water behind the dam. 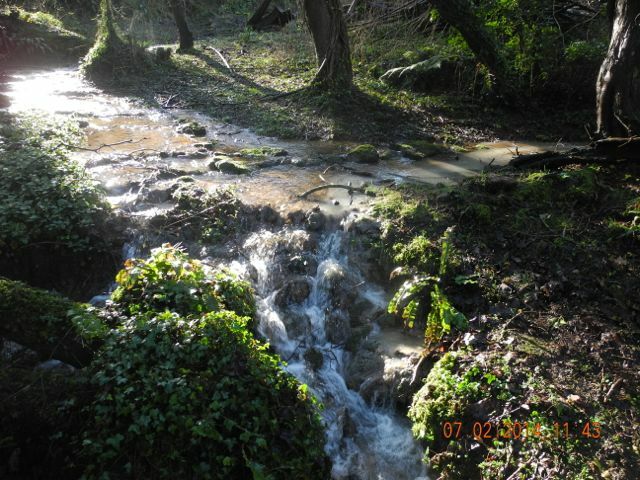 A rushing torrent of water coming down from the Dell. 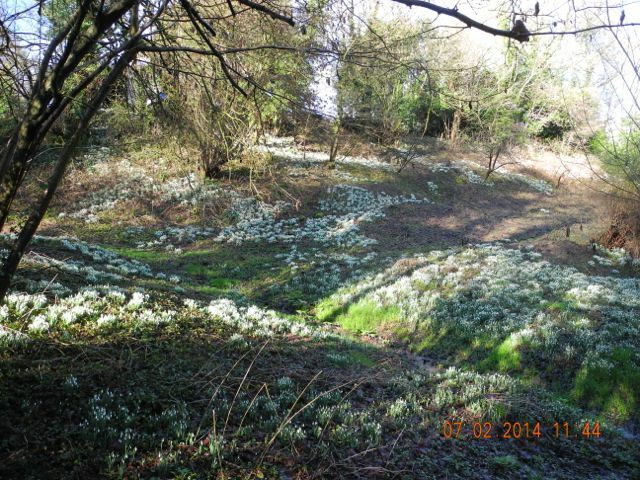 A sight enjoyed by few people this year, drifts of snowdrops below the East Terrace. 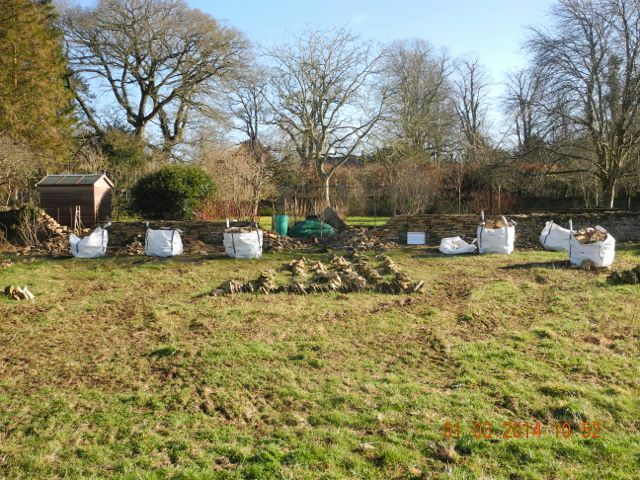 Work continuing on the Sunken garden. Steelwork goes it to support the big bulge. Detail of work around the north-east corner. 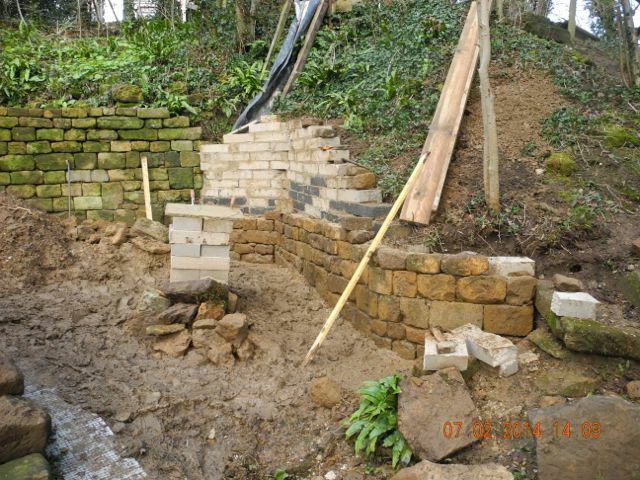 Despite the bad weather work continued on restoring and re-inforcing the walling around the Sunken Garden. 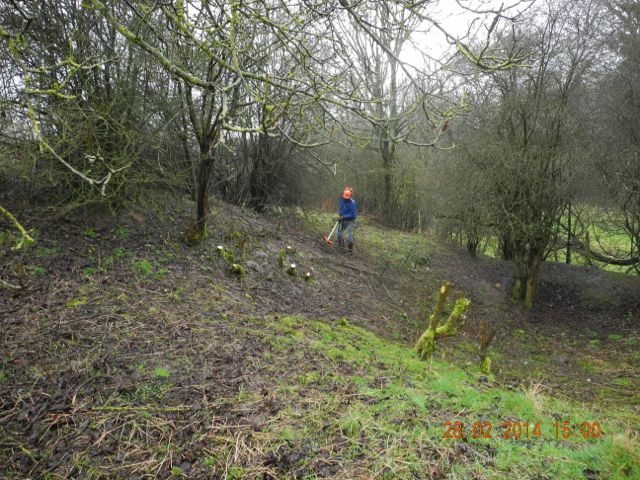 In the course of 'quarrying' for suitable stone the earlier layout of walling to the south of the area became clearer. Several fixed points were established around the Sunken Garden so that once the masons have moved on we can record it all in some detail. 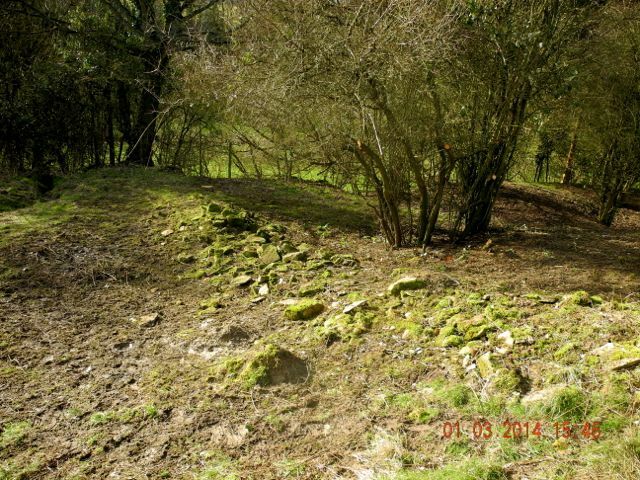 As part of this general process of clarification some undergrowth was removed from the slope up to the top terrace to reveal a carefully set stone facing or revetment. 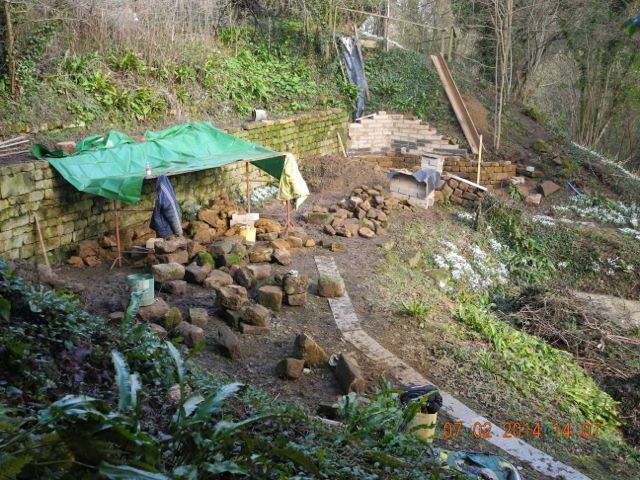 the revetment below the top terrace in the Sunken Garden, view looking north-east. 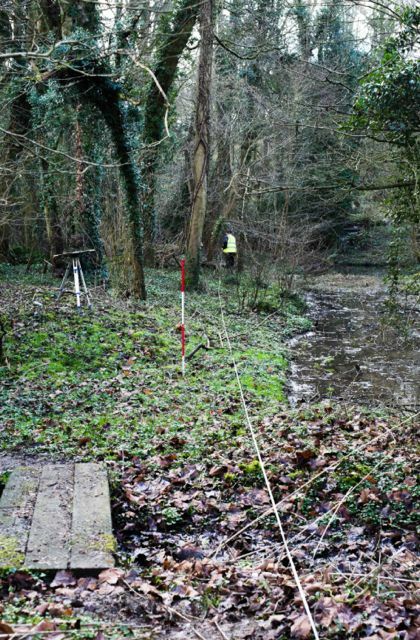 As we were reluctant to get in the way of the workers in the Sunken garden some time was spent setting up further fixed points to undertake the survey of the next 'pond' down the valley, the one where there is evidence of a rectangular moated island. All sorts of strange things are happening down here which will no doubt become clearer once they are down on the plan. Stephen puzzles. A baseline along the edge of the Lady Pool, view looking south. Peter saves the day. Of course work also continues both down in the Oxford archives and in the office. Efforts to complete the interim report on last year's work are coming close to completion. 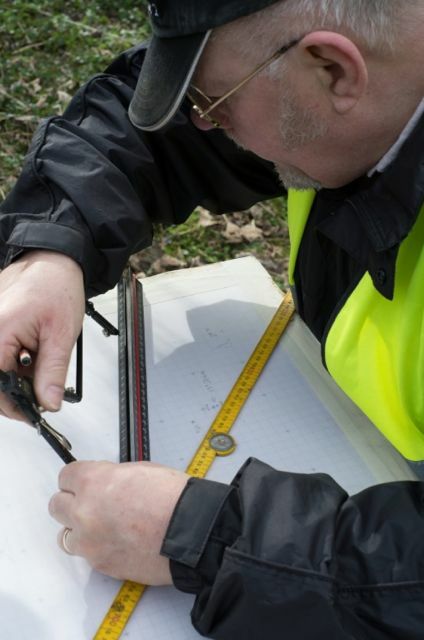 One of the most time consuming tasks is drawing out the finished versions of the plans and elevations measured and drawn in the field. Here is the completed plan of the lower levels of the Cascade.